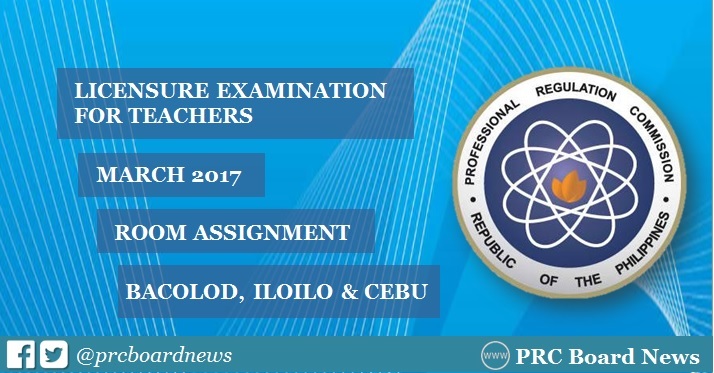 The Professional Regulation Commission (PRC) releases room assignment for March 26, 2017 Licensure Examination for Teachers (LET) in the cities of Bacolod, Cebu and Iloilo. On Thursday, full list of room assignment for Elementary and Secondary levels in Bacolod and Iloilo were made available online. UPDATE: PRC on Monday, March 20, announced list for Cebu City. The first LET this year will be conducted also in Antique, Baguio, Cagayan de Oro, Catarman (Northern Samar), Davao, General Santos, Iloilo, Legaspi, Lucena, Manila, Puerto Princesa (Palawan), Rosales (Pangasinan), San Jose (Occidental Mindoro), Tacloban, Tuguegarao, Pagadian and Zamboanga. LET covers general education and professional education subjects (Elementary Level) and with the inclusion of specialization for Secondary Level only. NOTE: We will also update this site for the results of March 2017 LET.